The DD-5500 is the newest member of the Fame eDrum family. As usual the features list reads just like it does from premium, famous manufacturers - until you get to the price! Like its predecessors, the DD-5500 offers the best possible quality at the lowest price. The complete package includes a snare pad, three tom pads, two cymbal pads, a hihat pad with pedal and a kick pedal with the appropriate pedal. This makes the DD-5500 the ideal piece of equipment for practicing, but with its high-quality sound module it is also an uncompromising performer on stage and is perfectly suited for the home studio. Optically the DD-5500 from Fame impresses with a sleek black design decorated with red accents. Everything that has established itself in the eDrum industry to date has been incorporated into the DD-5500. Snare and Tom pads feature two trigger zones, which are freely assignable. The trigger zones of the snare pad can both be silenced by hand via the choke function and the hihat controller features dynamic address behavior. The special rubber coating ensures that all of the pads are very quiet so that you can comfortably practice in your living room without enraging your neighbors. This coating also delivers a realistic play feeling with the expected stick rebound. The DD-5500 sound module is programmed with 26 preset kits allowing you to rock out immediately. There is space for 15 more of your personally created kits using 458 different drum and percussion sounds from various musical styles from Latin over Electro to Rock. All parameters such as volume, pitch and trigger sensitivity of each individually pad can be simply adjusted via the 128x64 LCD display. Additionally the DD-5500 sound module offers 3-band EQ and two reverb options. 20 Demo songs to play-a-long and a metronome help you feel the rhythm. This is a very nice drum for me. I want an equipment to study at my home without make noise to thr neighbours! The processor is nice and the USB link is a +! Nice purchase! Very good price. Easy to assemble to use. Professional appearance. First orchestral drum kit and practicing the perfect choice. One downside: the drums settings- the sensitivity setting should require some clarification. between 1 and 2 is too large difference. Very easy to assemble, wires are already deployed on the rack. Plays very nicely with sensitive pads (velocity), two zones per drum (mid and rim) and cymbals with silencing capability (by gripping it). 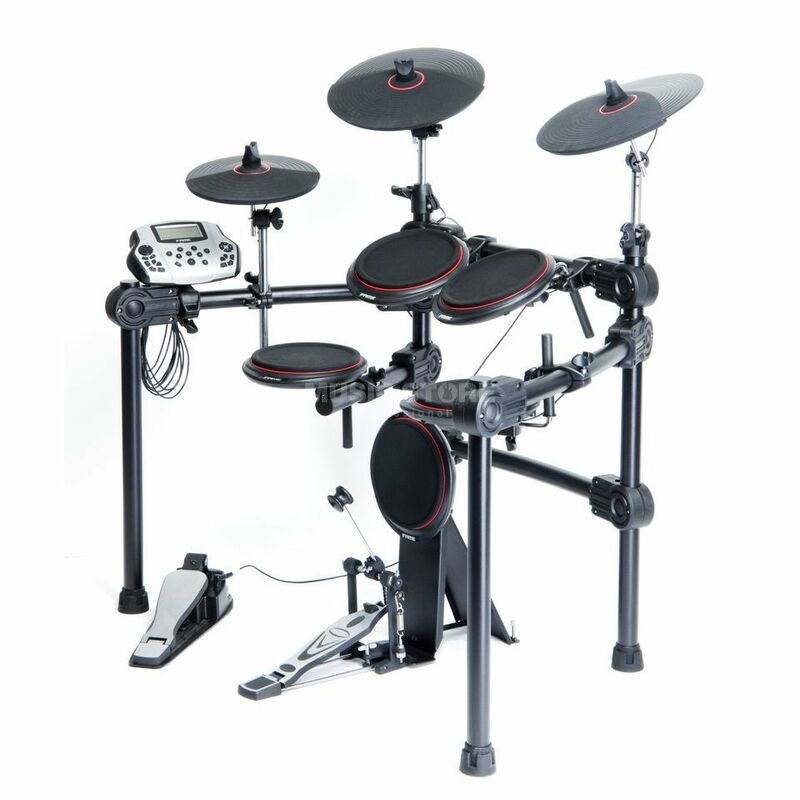 The rack itself looks very solid and it is easy to adapt the position and height of the drums. I liked the "real" bass paddle (with chain) and that the hi-hat provides a cool half-open position that sounds really nice.